This entry was posted in Appreciation, Awareness, Gratitude, Happiness and tagged Appreciation, Awareness, Encouragement, Gratitude, Happiness, Inspiration, Intention, Life, Love, Mindfulness, Motivation, Spirituality, Strength, Wisdom. Bookmark the permalink. This post put me into a nice sacred space. Thank you! 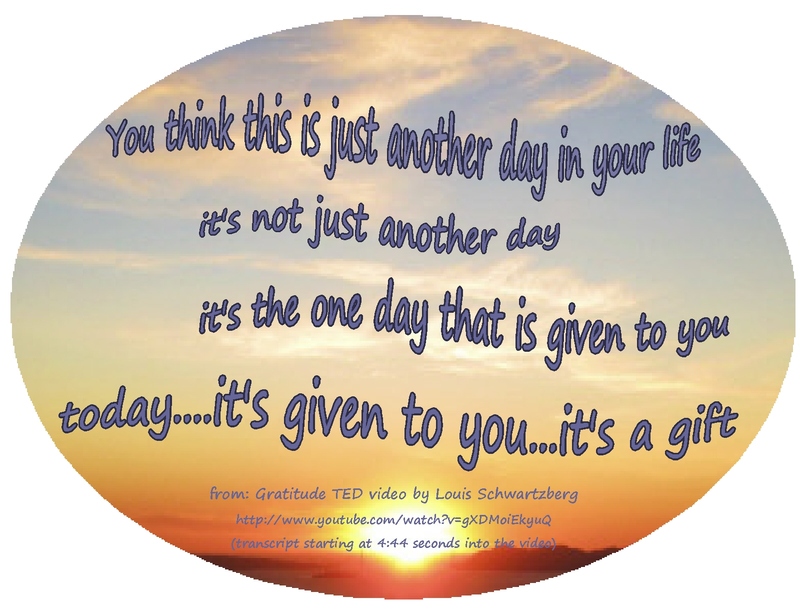 I watched the video, and was delighted I could enjoy it with the CC, and was inspired by the message of gratefulness. I then went on to light a candle to state my gratitude for today. This reminds me yet again of the power of the word, how one can make a difference and inspire. You inspired me again, tonight. I’m happy you enjoyed it…I love the video too. I had watched and listened to the Louis Schtwarzberg TED video for more than a year before I found out that it was narrated by Brother David Steindl Rast…he has such a wonderful voice! I like the candle lighting too…special. A wonderful post … and all important reminder. I have been to light a candle many moons ago — it was nice to return and remember! Thank you for sharing! I’m happy that others are moved by the ideas in the Gratitude video. And also happy that you find the candle lighting special, too….happy to pass it along. I’m now off to follow the candle lighting link. such inspirational ideas! Isn’t that candle lighting special too?